North Edinburgh Lingotot Centre | French and Spanish classes for kids. MFL PPA cover. 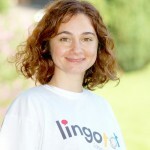 My name is Giselle and I am running Spanish sessions in Edinburgh. My story started in the beautiful city of Buenos Aires where I was born and lived the years of my infancy. It continued in sunny Spain after my family moved there and I finished my years of Primary School, Secondary School and went to University to become a Primary Teacher. The latest chapter has seen me settle in the equally beautiful city of Edinburgh where I met and married my husband and made my home. We now have two lovely kids, Nayra and Owen, and thanks to them we had the chance to ride rollercoaster of parent and child sessions and all the fun and frolics that they entail as we took part in sensory expression sessions, baby signing sessions, swimming classes and various others - often as much fun for the mums and dads as for the children! Since myself and my husband both speak a number of languages our children have grown up in a bilingual environment so we never had the need to take part in any language based sessions but now that they are enrolled in Gaelic Medium Education we have now begun to see the benefits that their early start in language acquisition has given them. And this is the benefit that Lingotot will pass on to yourselves and your little ones. Lingotot classes are packed full of interactive songs, games and stories and most importantly are fun! All of the sessions are conducted almost entirely in the target language and you learn with your children. Classes are suitable for babies, toddlers, young children and their parents/carers so that the whole family can enjoy learning a new language together. We offer plenty of support for mums, dads and grandparents, so you can continue your family's language learning journey at home.